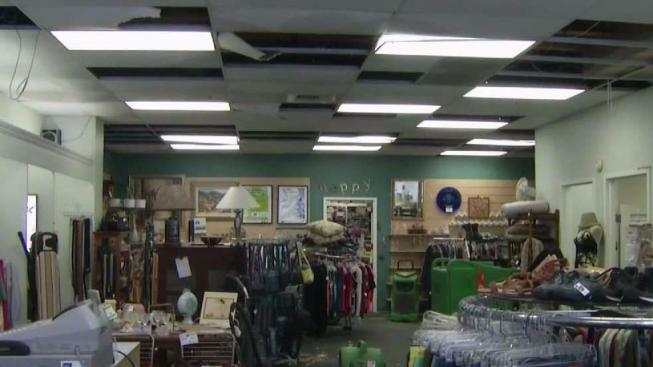 A popular South Bay thrift store that has raised hundreds of thousands of dollars for cancer research was forced to close this week after a water heater burst, causing major damage. The Discovery Shop in Los Gatos, which sells donated goods to benefit cancer patients, may now be forced to move as a result. The water heater located on the second floor burst overnight Saturday, flooding the entire store. The American Cancer Society said an estimated $50,000 in inventory was damaged, and it may take a while to make repairs. "Currently, we are looking at what we may be able to salvage," store Manager Rita Melamed said. When shoppers arrived at the shop Wednesday, they were turned away. Inside, the carpets were soaked, part of the ceiling was missing, and there was broken glass. Most of the clothes cannot be sold. Volunteers on Wednesday were able to salvage some wood furniture and put it into storage. An American Cancer Society spokesman said because they don't yet know how long repairs will take, they aren't sure how long the store will remain closed, and it's possible the shop could be forced to move. Customer Mable Grabeel of Los Gatos said she was "very disappointed." The Discovery Shop earned more than $350,000 for cancer research and patient programs last year. A fundraising effort has been started on Crowdrise to help the store reopen.